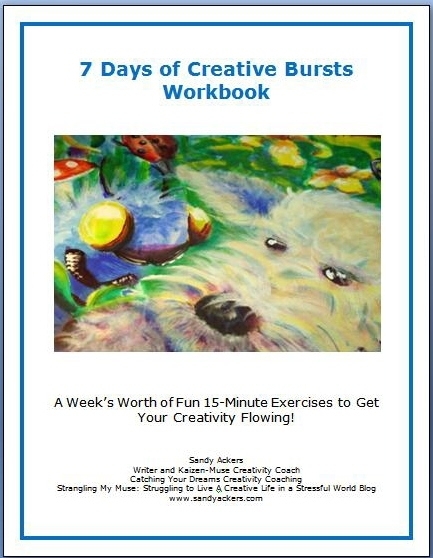 Don’t Forget to Download Your Free Creative Bursts Workbook! Have you downloaded your free 7 Days of Creative Bursts Workbook yet? It’s a week’s worth of fun, 15-minute play breaks designed to help get your creativity flowing! You’ll also get free Creative Bursts delivered to your inbox twice a week, so you can keep the flow going once you’ve played your way through the workbook. If you’d like to download your free Creative Bursts Workbook now, click here or on the workbook cover at the top right corner of this blog. The Creative Bursts are different from the exercises I offer on this blog. The vast majority of prompts on this blog focus on writing — while the Creative Bursts include a mix of drawing, doodling, writing, dancing, cartooning, focused daydreaming and more. Many of the Creative Bursts are a bit whimsical, because tapping into our childlike joy helps us go to a truer creative place. And I’ve included some extra goodies at the end. p.s. I promise to never, ever share your e-mail address, and you can easily unsubscribe from Creative Bursts at any time with one click. Thanks Sandy! This is fantastic! I’m happy you like it, Tami! Hi Sandy, I’ve just done “your day as a movie synopsis” burst you sent me today. Is there somewhere I can post it on here? Thank you for the Bursts, they are hopefully going to restore some sanity! Or click on Readers’ Sandbox, then Creative Bursts. I’d love to see what everyone’s creating. Thanks for suggesting this, Miss H!